I have three crochet WIPs on the go at the moment; two you know about (my Spring Stripes and the cornflower blue edition of my Baktus Wrap) and one you don't (I've called it Angel Delight - more on that one very soon, I promise). Well, as much as I'm enjoying each of them, sometimes it's really rather lovely to take a break and indulge in a little gratuitous whimsy, don't you think? As my cross stitch on crochet crush continues, I thought I might share just such a make with you. 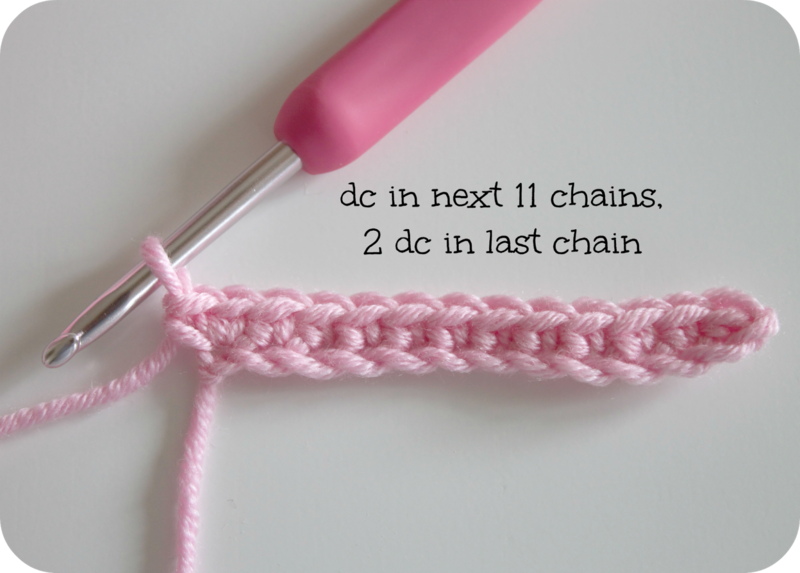 It's delightfully simple (an evening's work, tops) and is perfect for using up those itty bitty scraps of yarn. It's a phone cosy. A fruity one. I made it using purely double crochet stitches (US single crochet) in the round, a 4mm hook and some Sublime dk yarn I had left over from a previous project. 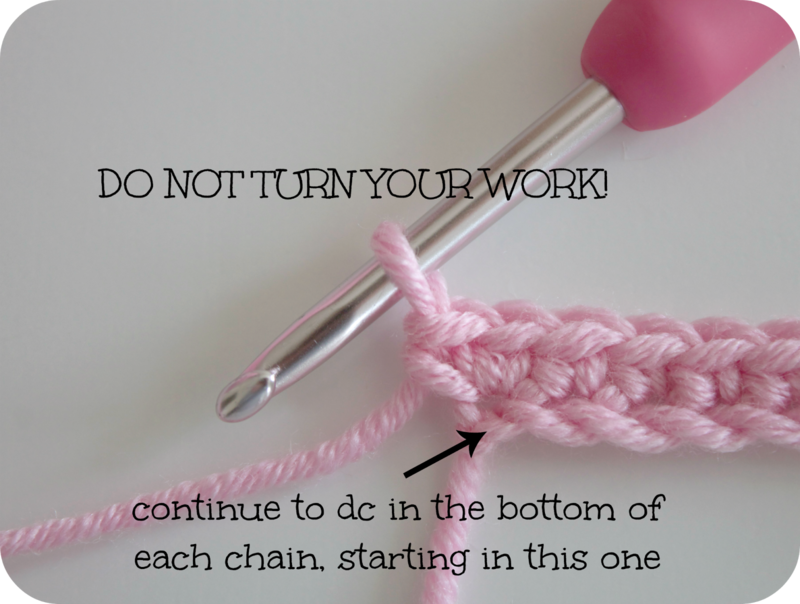 Do not make a join, simply dc into stitch 1 and continue. It's worth sliding your phone into the cosy now and again, as you progress, to ensure a good fit. 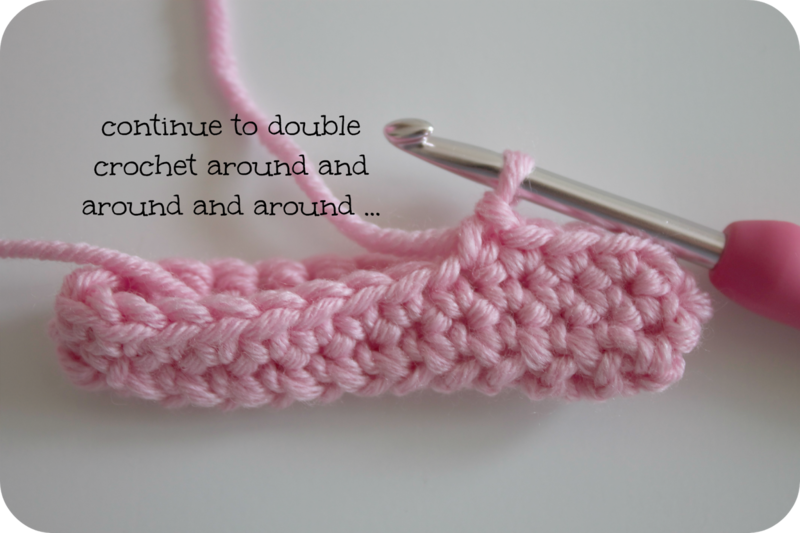 Keep crocheting until your cosy reaches the desired height. I think mine was 26 rounds. 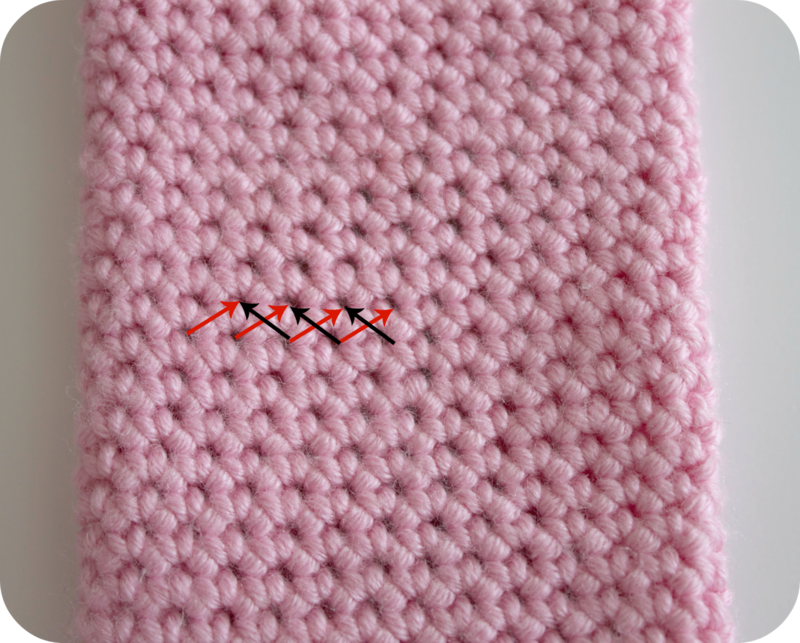 Slip stitch to finish and weave in the end. Double crochet lends itself to being decorated with cross stitch as the holes between in each stitch are nice and even, see? I used a tapestry needle and some scraps of Debbie Bliss Baby Cashmerino for my cross stitch. I can't possibly go before telling you that, no sooner had I finished photographing my cherry cosy, my 12 year old daughter (who normally breaks out in a rash at the mere thought of being seen with something her Mum made) snaffled it! I know! I huffed and puffed with pretend indignation but was secretly tickled pink! So I made another. For me. Squint and they could be little roses, non? P.S I do the squint thing often, it's amazing what happens! They are lovely Heather! Can't decide which one i like best as they are both so pretty! 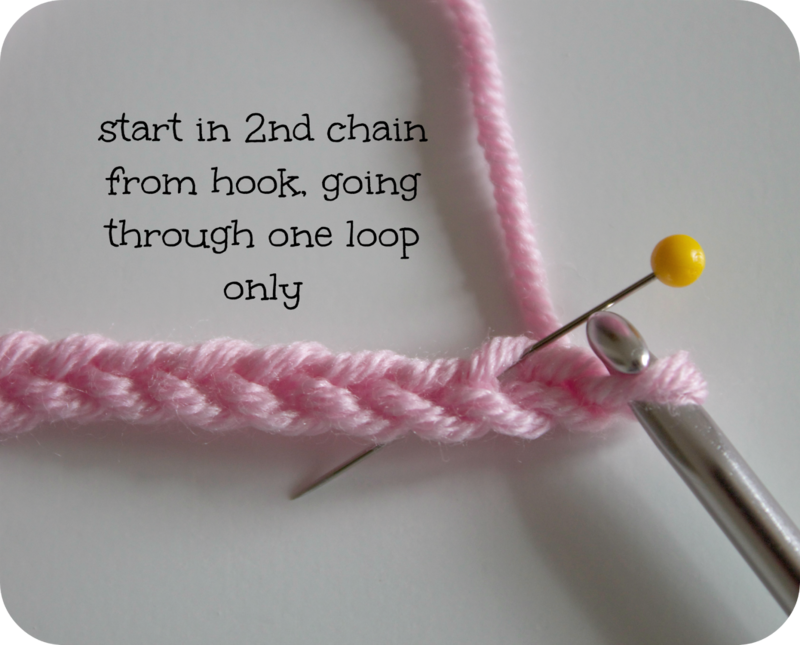 Great way of using up stash yarn, looks an easy pattern to make up the way you've wirtten it, and you've done it all beautifully neat as usual! Good luck with your entry in the competition Heather! Great tutorial. It's so cute, I might have to make one or two! Thank you. These are gorgeous Heather! Thank you for sharing your tutorial. Good luck with your entry to the Deramores Blog Awards! Seriously cute Heather, and seriously clever how you do that whole thing of writing on your photo's ! You're a clever bean for sure. Think you've got a winning entry there ! 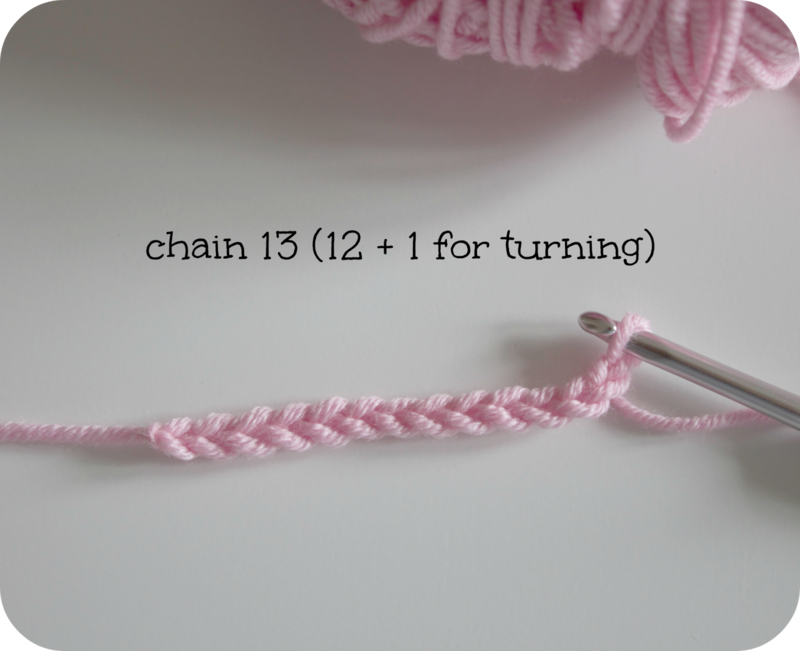 Definitely cute, although the whole crochet thing is double Dutch to me! Love the idea, I think I will try it. Snap! 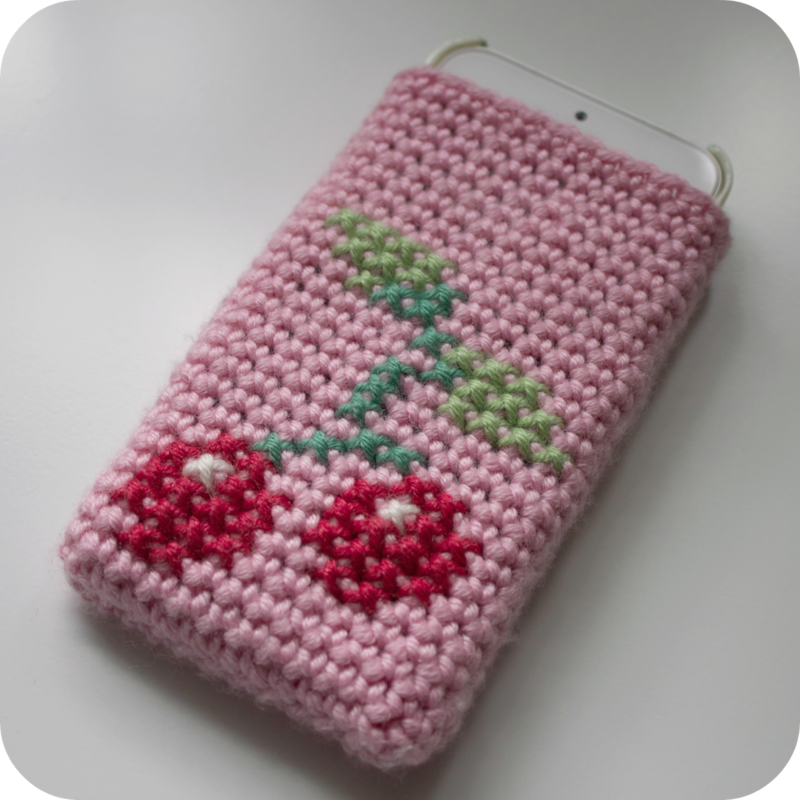 I made a phone case with cross-stitched cherries on too! 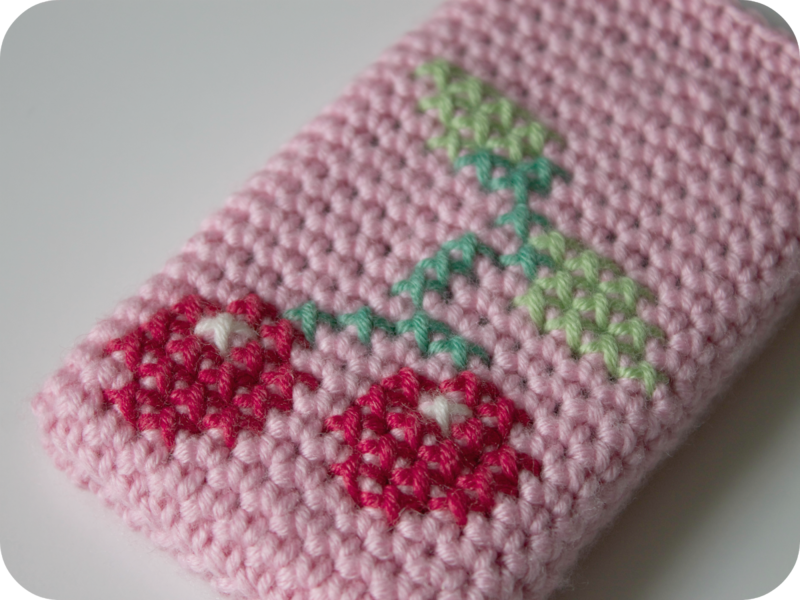 ( http://dinkidots.blogspot.co.uk/2014/01/crochet-and-cross-stitch-phone-case.html ) I love the effect of cross-stitching on crochet, and so great how the holes are there ready to be used! The case with the little roses is so pretty too! 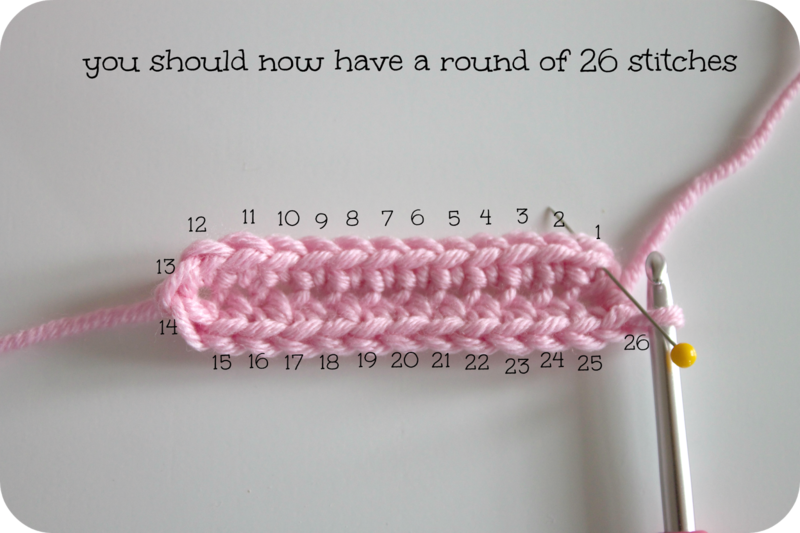 I just came across your lovely pattern on Ravelry, I'm going to make it today. I was just a bit confused, you say to make dc's but the photo's show sc's…I just want to make sure before I begin. thank you for this one too. good pattern! Thanks to your pattern/tutorial I managed to make two of these after struggling a dozen times with a different pattern. 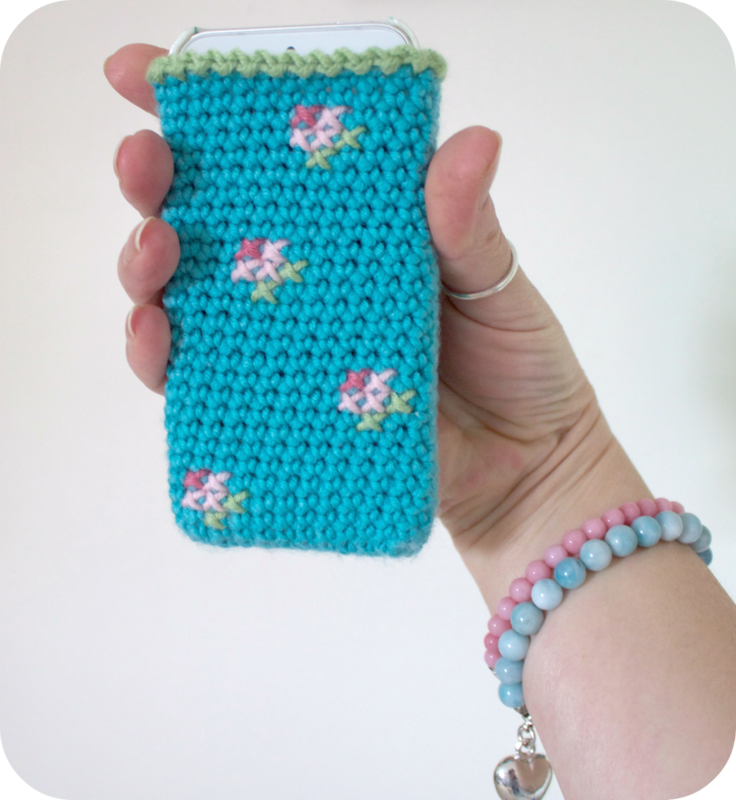 Now I have a lovely new phone case for my new phone :) What would happen if I changed the amount of stitches in the foundation chain though? Does it need to be an even number +1 for connecting? 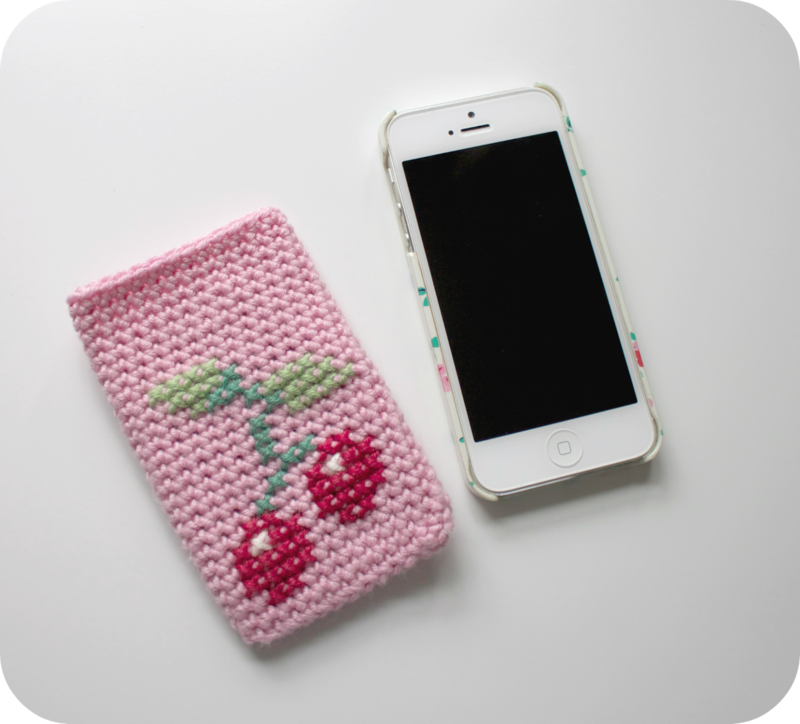 One of the two I successfully made was the same size as the pattern which is too small for my phone (Samsung Galaxy J5) and the other one ended up larger than my phone somehow. Not sure how I managed that. Help! thank you ,m itzz just an amazing tutorial ever .More clear than videos i have seen. 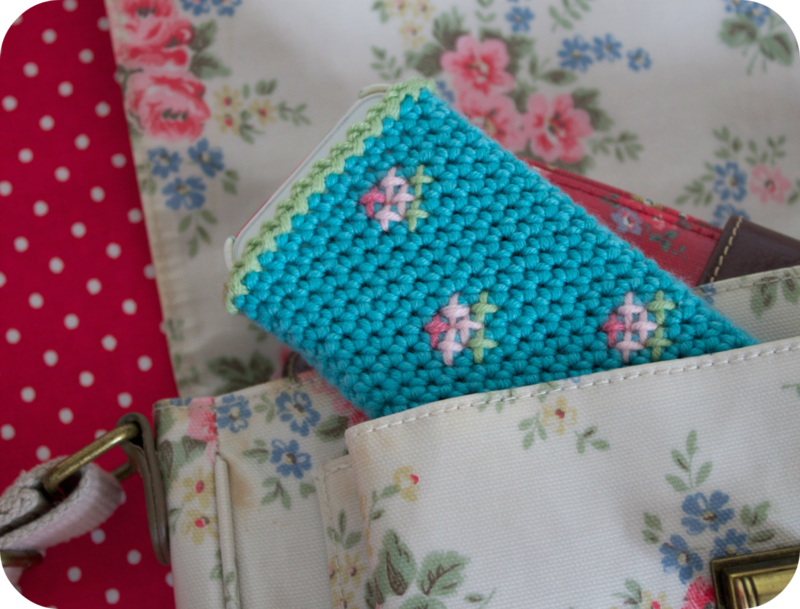 mam can you name what branded yarn you are using for this pouch and exact hook size.